Superior efficiency on the fireground – delivering more GPM with lower friction loss. Lightweight and flexible, easy to handle for less working stress. Nitrile rubber cover greatly increases abrasion resistance, providing a long service life. Smooth inner liner reduces friction loss. Available in 4” and 5” diameter supply lines. 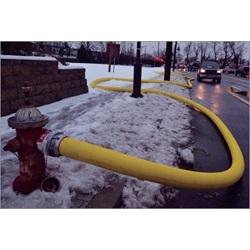 Hi-Vol II is an economical alternative to the original, Angus Hi-Vol large diameter supply hose. Hi-Vol II is lightweight, compact, and durable, with the ability to flow large amounts of water more efficiently. Hi-Vol II also offers improved abrasion resistance and is highly resistant to punctures, cuts and fireground impact. 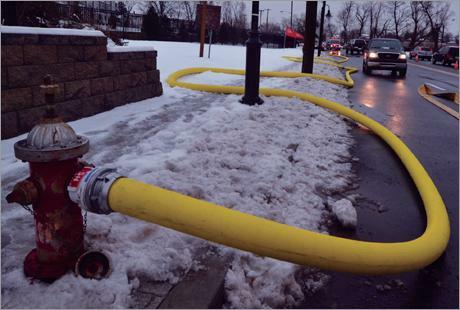 HI-Vol II was designed specifically to meet the needs of budget conscious municipal and volunteer fire departments.